Come on everyone. Let’s admit it. We’ve all been one of those people who have enthusiastically pulled on our gym kits at the start of the New Year, marched our way to our local park, before running the staggering distance of 1 meter along the path before sitting on the nearest bench “Just for a quick breather” (as you don’t want to over do it on your first day) then NEVER returning to said park ever again! So to help people along their way, Nike have given park runners a little ‘boost’ by placing a series of Nike benches around local parks with no seats on them! Wonder how many have *actually* been placed? Anyone? Call me cynical, but smells like one of those awards entries that says loads of ‘stuff’ was put up/distributed/etc., when in fact it was just a few for the purposes of a good photo or two. Be happy to be proved wrong! I do also fear that somebody’s going to slap Nike with a ‘you badly bruised/broke my ar*e’ lawsuit….! I’m inclined to agree, Martin – no company in their right mind would place loads of these when one or two would achieve exactly the same public/media response. Sure Rich. 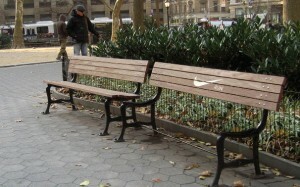 I’ve since learnt that this wasn’t actually done by Nike – it’s actually a student’s work. On a related note, it does baffle me that Awards can be won by ‘stunts’ which allegedly involve dozens of executions…when in fact it’s pretty obvious one (or a few) was/were done, but photographed very nicely and then eloquently bullshi**ed about. Doesn’t seem to be much fact-checking going on…!